I tried my hand at the faux wood grain look with kraft cardstock, Versamark and a wood grain stamp. Then I colored the raccoon image from Imaginisce with my copic markers and cut the image out. 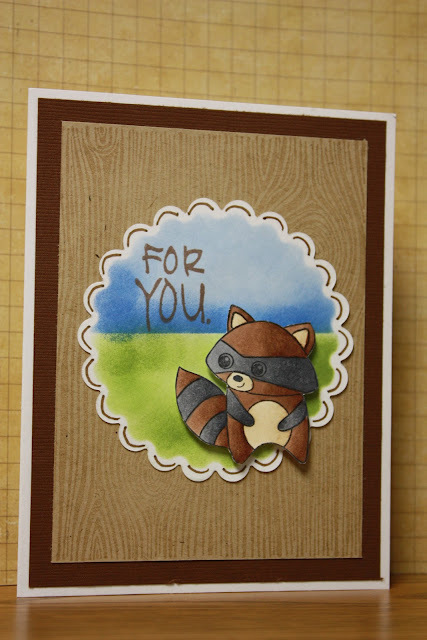 Using my nesties I cut out the scalloped circle, sponged the background on with Momento Ink and pop-dotted the raccoon image over top. I added some doodling on the circle and a sentiment. I decided today to share another card with you. This image is another one from Stampavie and I think it's too cute. Again I colored with my copic markers. I used pattern paper from Cosmo Cricket's Chemistry line. The sentiment is pop-dotted just over the corner of the image slightly.